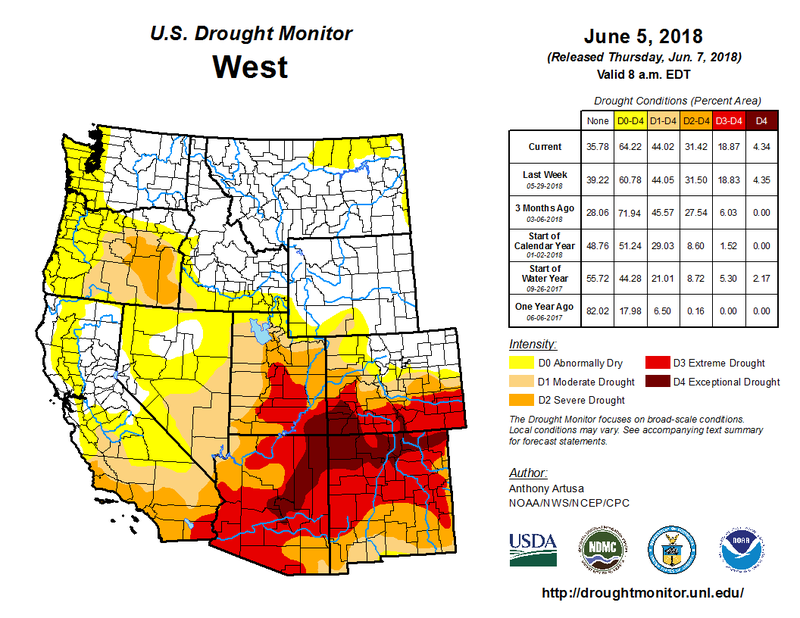 West Drought Monitor June 5, 2018. The latest monthly briefing was posted today on the Intermountain West Climate Dashboard. The highlights, also provided below, cover current snowpack and drought conditions, runoff and reservoir conditions, May precipitation and temperature, and ENSO conditions and outlooks. Below-normal precipitation for May and early June in most areas has clinched an extremely poor runoff season for Utah and southern and western Colorado. Meltout and peak runoff occurred 3-6 weeks earlier than normal in most of those basins. The low winter and spring precipitation and warm May temperatures have led to very high wildfire risk, with multiple large fires currently burning in Colorado and Utah. As of June 11, snow remains at less than 10% of the SNOTEL sites in Utah, Colorado, and Wyoming, and the current SWE is well below normal at nearly all of those sites. Even in those areas that had near-normal or above-normal peak SWE this spring, the snowmelt since mid-May has been unusually rapid. Observed monthly flows for May were around or below the 10th percentile for most gages in central and southern Utah and southern Colorado, with record-low May flows at a handful of gages in those areas. Observed flows in northern Colorado and northern Utah have been generally closer to average, while Wyoming had above-normal to record-high May flows in most basins. Due to the low May inflows, June 1 reservoir storage in Utah and Colorado has slipped compared to May 1, but is still slightly above average overall. May precipitation was below normal to well below normal for western and southeastern Colorado, western and far southern Utah, and south-central Wyoming. The rest of Wyoming, northeastern Colorado, and northwestern Utah had wetter-than-normal conditions. May temperatures were much warmer than normal across the region, with some parts of western Colorado experiencing the warmest May on record. Since early May, drought conditions have worsened in northeastern Utah and southeastern Colorado, while improving in north-central Colorado. D4 conditions persist in the Four Corners region and the Sangre de Cristo Mountains. The total area in the region affected by drought is similar to one month ago. As of June 5, 60% of Utah is in D2 or worse, and the remainder in D0 or D1; in Colorado, 51% is in D2 or worse, and 24% in D0-D1; and in Wyoming, only 14% is in D0-D1, with no D2-D4. The La Niña event has finally petered out and ENSO-neutral conditions prevail in the tropical Pacific. The majority of models predict ENSO-neutral conditions to continue through fall 2018, with 50-50 odds for the emergence of El Niño conditions by winter 2018. The CPC seasonal precipitation outlooks for the June-August and July-September periods show slightly enhanced chances for an above-normal monsoon season affecting southern Utah and western Colorado, which would be most welcome if it occurs.